In those days Chittod was under the Rule of King Rawal Ratan Singh, a brave and noble warrior-king. Apart from being a loving husband and a just ruler, Ratansen was also a patron of the arts. In his court were many talented People one of whom was a musician named Raghav Chetan. But unknown to anybody, Raghav Chetan was also a sorcerer. He used his evil talents to run down his rivals and unfortunately for him was caught red-handed in his dirty act of arousing evil spirits. On hearing this King Ratansen was furious and he banished Raghav Chetan from his kingdom after blackening his face and making him ride a donkey. This harsh Punishment earned king Ratansen an uncompromising enemy. Sulking after his humiliation, Raghav Chetan made his way towards Delhi with the aim of trying to incite the Sultan of Delhi Ala-ud-din Khilji to attack Chittor. On approaching Delhi, Raghav Chetan settled down in one of the forests nearby Delhi which the Sultan used to frequent for hunting deer. One day on hearing the Sultan's hunt party entering the forest, Raghav-Chetan started playing a melodious tone on his flute. When the alluring notes of Raghav-Chetan flute reached the Sultan's party they were surprised as to who could be playing a flute in such a masterly way in a forest. The Sultan dispatched his soldiers to fetch the person and when Raghav-Chetan was brought before him, the Sultan Ala-ud-din Khilji asked him to come to his court at Delhi. The cunning Raghav-Chetan asked the king as to why he wants to have a ordinary musician like himself when there were many other beautiful objects to be had. Wondering what Raghav-Chetan meant, Ala-ud-din asked him to clarify. Upon being told of Rani Padmini's beauty, Ala-ud-din's lust was aroused and immediately on returning to his capital he gave orders to his army to march on Chittor. But to his dismay, on reaching Chittor, Allah-ud-din found the fort to be heavily defended. Desperate to have a look at the legendary beauty of Padmini who actually was a princess of sri lanka[singhal], he sent word to King Ratansen that he looked upon Padmini as his sister and wanted to meet her. On hearing this, the unsuspecting Ratansen asked Padmini to see the 'brother'. But Padmini was more wordly-wise and she refused to meet the lustful Sultan personally.On being persuaded by her husband Rana Ratansen, Rani Padmini consented to allow Ala-ud-din to see her only in a mirror. On the word being sent to Ala-ud-din that Padmini would see him he came to the fort with his selected his best warriors who secretly made a careful examination of the fort's defences on their way to the Palace. On seeing Padmini, in the mirror, the lustful 'brother', Allah-ud-din Khilji decided that he should secure Padmini for himself. While returning to his camp, Allah-ud-din was accompanied for some way by King Ratansen. Taking this opportunity, the wily Sultan deceitfully kidnapped Ratansen and took him as a prisoner into his camp and demanded that Padmini come and surrender herself before Allah-ud-din Khilji, if she wanted her husband King Ratansen alive again. 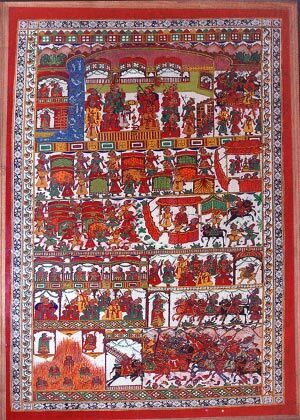 The Songara Chauhan Rajput generals Gora & Badal decided to beat the Sultan at his own game and sent back a word that Padmini would be given to Ala-ud-din the next morning. On the following day at the crack of dawn, one hundred and fifty palanquins (covered cases in which royal ladies were carried in medieval times) left the fort and made their way towards Ala-ud-din's camps The palanquins stopped before the tent where king Ratansen was being held prisoner. Seeing that the palanquins had come from Chittor; and thinking that they had brought along with them his queen, king Ratansen was mortified. But to his surprise from the palanquins came out, not his queen and her women servants but fully armed soldiers, who quickly freed Ratansen and galloped away towards Chittor on horses grabbed from Ala-ud-din's stables. Gora fought bravely during the skirmish and laid down his life while Badal was able to took the Rana safely to the fort. On hearing that his designs had been frustrated, the lustful Sultan was furious and ordered his army to storm Chittor. But hard as they tried the Sultans army could not break into the fort. Then Ala-ud-din decided to lay siege to the fort. The siege was a long drawn one and gradually supplies within the fort were depleted. Finally King Ratnasen gave orders that the Rajputs would open the gates and fight to finish with the besieging troops. On hearing of this decision, Padmini decided that with their men-folk going into the unequal struggle with the Sultan's army in which they were sure to perish, the women of Chittor had either to commit the divine suicide called as Jauhar or face dishonour at the hands of the victorious enemy. The choice was in favor of suicide through Jauhar. A huge pyre was lit and followed by their queen, all the women of Chittor jumped into the flames and deceived the lustful enemy waiting outside. With their womenfolk dead, the men of Chittor had nothing to live for. They decided to perform Saka. Each soldier got dressed in kesari robes and turbans. They charged out of the fort and fought on furiously with the vastly Powerful array of the Sultan, till all of them perished. After this pyrrhic victory the Sultan's troops entered the fort only to be confronted with ashes and burnt bones of the women whose honor they were going to violate to satisfy their lust.